St. John’s can be proud of many things, the history, the views, accommodations, jelly bean row houses, music, pubs and of course the restaurants. As good as “Fish and Chips” is in the city and around the province , man can not live on cod alone. Blue on Water is a classy but unpretentious restaurant on Water Street and offers a menu that would surely suit most taste buds. The friendly welcome and décor set the tone for the evening with my wife Lisa. 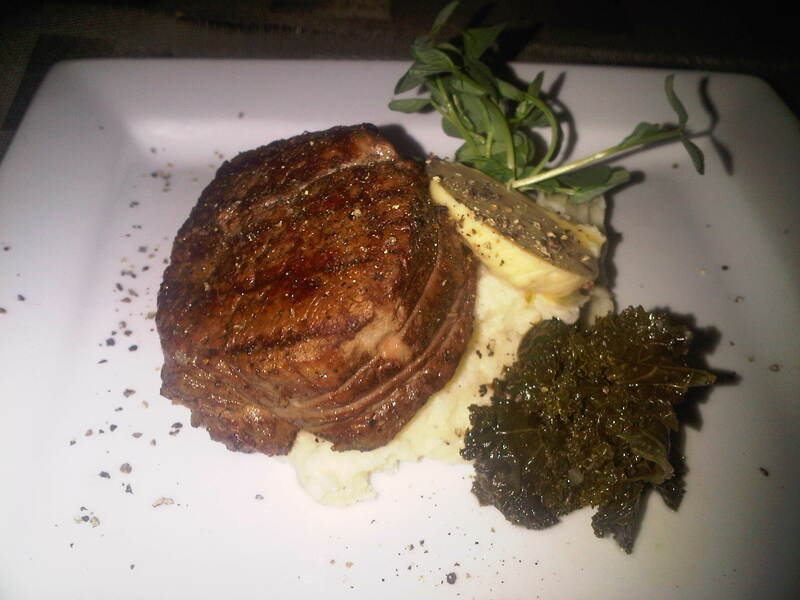 The server was pleasant and knowledgeable which also made for a relaxing evening in the city. 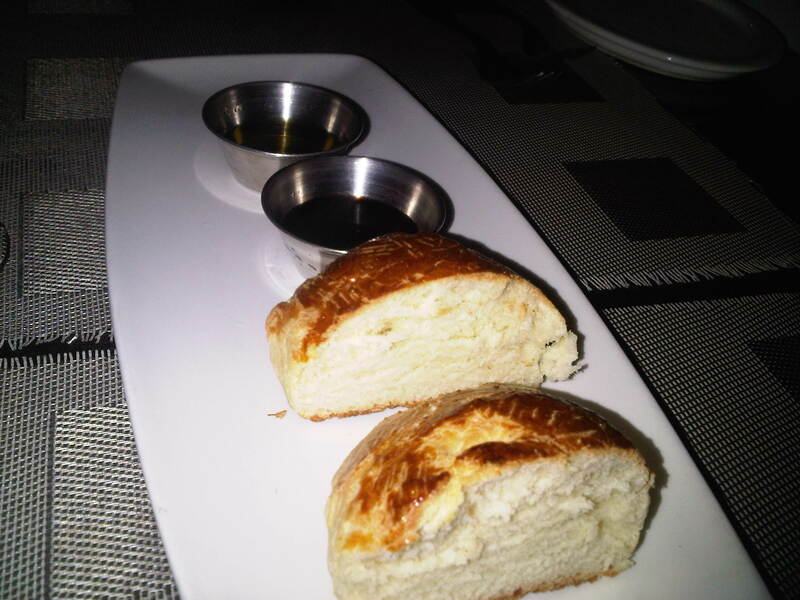 While enjoying a glass of malbec we were treated to some warm bread , balsamic vinegar and olive oil . The bread was a little “cakey” but for me, it was how I like it. The blend of the oil and vinegar on the bread was very tasty over adult conversation. We started with a pork belly marinated and braised in calvados served with house brined sauerkraut and crackling which we shared, after all it was date night . We were glad we did as it was a large portion for a started and the flavours were rich and delightful. 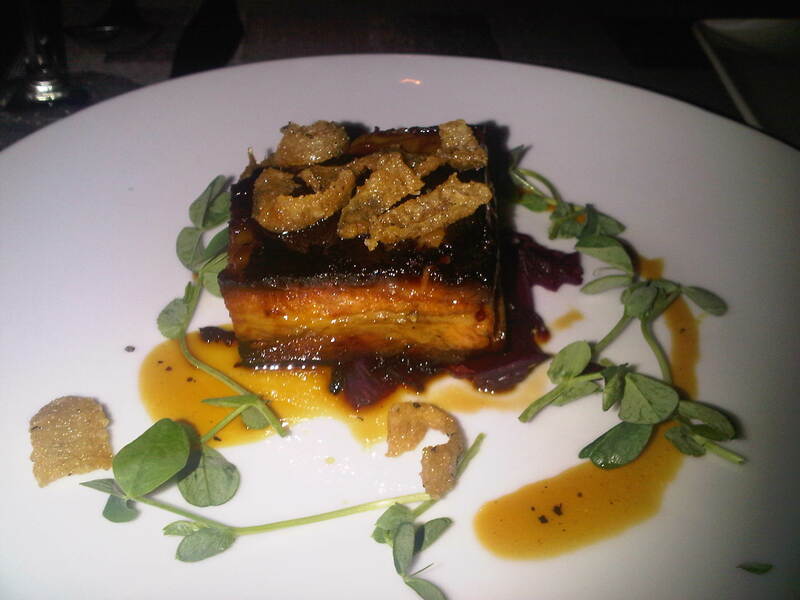 The crispiness of the crackling and the depth of flavour from the calvados gave this app thumbs up from the both of us. The timing between the course was perfect, it allowed us the time to soak in the atmosphere of this bustling but laid back restaurant. I ordered the grilled beef tenderloin with a foie gras and cognac butter with whipped potato and a bacon and shallot braised kale. I liked the presentation , the beef was cooked to my specifications but I was a little over zealous in trying the foie gras and cognac butter, it was very rich and I should of waited for it to meld with the potato and beef, once melted a lil it was amazing. The whipped potato was very pleasant, the texture was creamy and a nice accompaniment to the beef. The kale was a pleasant surprise with the overtones of the bacon and gentleness of the shallot it was a tease and could stand alone. My wife Lisa had the Chicken Supreme oven roasted with broccolini and braised kale shallot bread pudding, drizzled with pomegranate jus. Of course I had to taste it!! 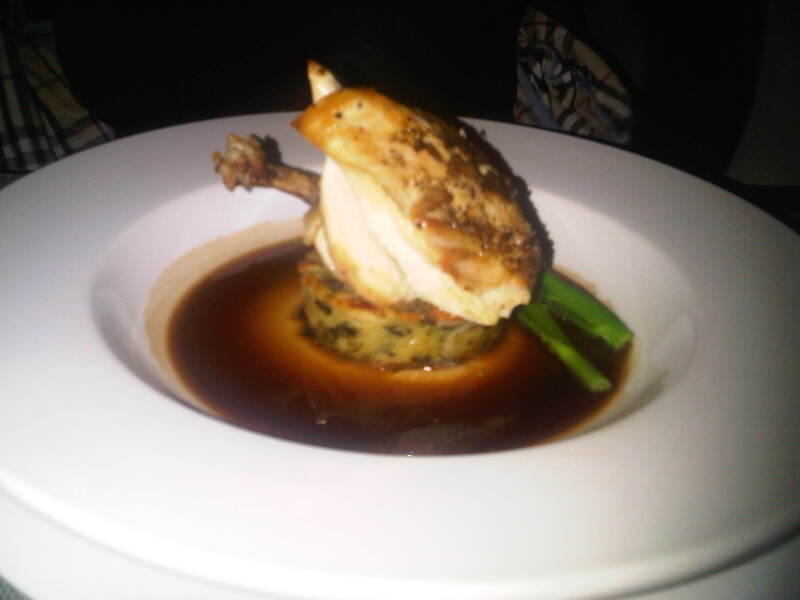 Both of us enjoyed the moist chicken and the bread pudding which blended well with the jus. Lisa said she would definitely have it again (and that is high marks from her). As most of those who regularly read my blog would know, if I can’t write about the good things in a restaurant I will usually not write anything at all. (I will send a private note to highlight some of the things that need correction/consideration or that pissed me off, to the owner as a warning shot as I think this is better than bashing them in public for what could of been a off night) In the case of Blue on Water there was no need of a private note, I offer the high points and low points.  A little too dim for my taste, especially during our service the lights were turned down again. 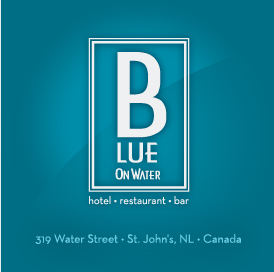 On a side note, if your are down town and are looking for a good burger and the best fries in NL, well Blue On Water has those too. 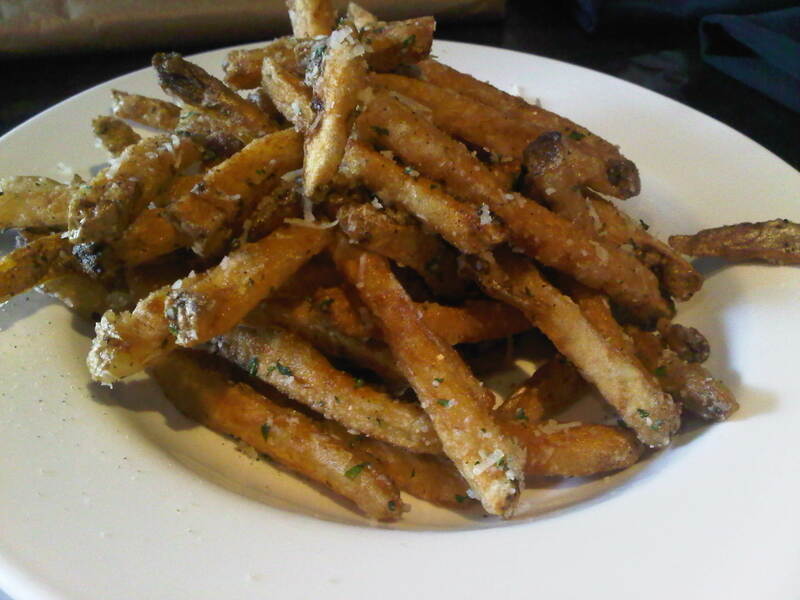 Their “Truffle Fries” are fries dipped to perfection with parm cheese and a spray of truffle oil, simply heavenly, you have to check them out! !